In April/May of 2011 Debbie and I, with a 6 month old in tow, returned to Ireland for Debbie’s sisters wedding. We were lucky enough to have a week side-trip in Praia da Luz in Portugal thanks to the generosity of the parents-in-law of Debbie’s brother who let us stay in their holiday apartment. Luz is one of the quieter resort villages on the Algarve and is somewhat famous for the wrong reasons, but we enjoyed it and it was as relaxing as it can be with a 6 month old. We had dinner at The Dolphin Restaurante, a South African restaurant that includes dishes such as Sosaties, Bobotie, Pokjiekos and Boerewors. The dish that stood out to me, and I just had to have, was the Ostrich Schnitzel. And the wine we picked was the Herdade do Esporão Reserva Tinto 2008 from Alentejo in Portugal, where a lot of the world’s cork is grown. It’s made from Aragones, Trincadeira, Cabernet Sauvignon & Alicante Bouschet (I wish we had better access to Portugese wines here in Australia because they are something different). We were recommended that this wine would go well with our dishes and that was spot on! It was a great food wine with lots of fruit flavour that perfectly matched the strong, but delicious, gamey taste of the Ostrich Schnitzel. A thoroughly enjoyable red. We both wanted more of this wine when it was finished, and that’s what we ended up doing. In the days afterwards we searched the bottle shops and eventually found it in the bustling resort town of Alvor. We picked up a couple of bottles and transported them home buried deep within our bags (with a couple of Ports for the old man in there too somehow). We had one of the bottles in mid 2012 and it was just as good as we remembered it. It still seemed fresh and full of life so I decided to keep the remaining bottle for a special occasion. I was talking to Stu about my first ever post on this blog last Sunday afternoon and he encouraged me to pop open a bottle to celebrate, not that I normally need encouragement but I do “try” and keep drinking on school nights down to a minimum. 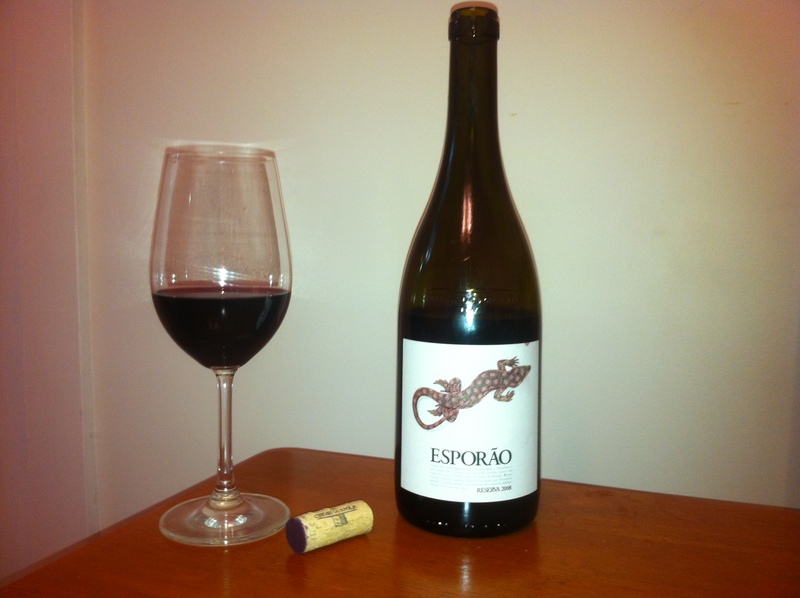 I decided to open the remaining bottle of Esporão and thought I’d write about it. It was a disappointment. It wasn’t bad at all, and still quite drinkable, but it just wasn’t the wine I remembered. It was quite flat and lacked a lot of the flavour and depth it once had. There was just no wow factor to it anymore. The love was lost! And that’s the thing about keeping wine based on a “moment” you may have had. Sure, it was great at the time, and drinking wine is just as much about the experience as it is about the wine itself, but a wine’s time can pass and you may be left with something that will just let you down. This wine should have been drunk a year ago and there was no real reason to keep it other than sentimentality. If you get back to Portugal you would likely enjoy a visit to Esporao (about three hours drive east from Lisbon) for a tour of their magnificent facility and restaurant – and if possible, call ahead and see if you could meet with long-time Esporao technical director (and Australian!) David Baverstock! I have written about and used his wines in a number of tastings where they have rec’d great praise. Hope you find some more Esporao in the future (that hold up better than the last one you tasted). Cheers, I really appreciate you taking the time to read and comment on our blog. Very knowledgable and informative and I love learning new things about wine and getting that bit of extra info. Thanks. I knew it! You’ve been to Portugal! You just want to go there cause you know who is prettier than me.